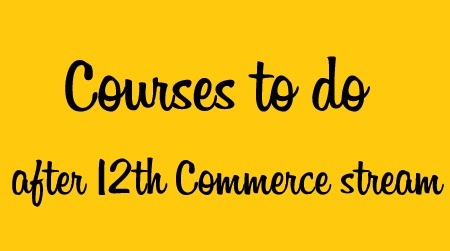 This blog will help you to Pick a Right course after 12th commerce and pursue your career and build good career in commerce section. This is the general degree if you have low percentage in 12th commerce, so you can pursue B.Com Pass and You can also Pursue professional Course like CA, CS, or ICWA. B.com course during is 3 years. You can do full time or part time study in B.com it depends on you. This course is similar to B.com but is has some extensive from with specialization in a particular or field like accountancy, management or economics etc. The industry demand for B.com (hons.) is better the normal B.com. But the Admission criteria and eligibility conditions might be similar for both. The Subject are also quite similar to the b.com. This is the another option for commerce stream and students to pursue after their higher secondary education. Your will get to experience practical knowledge on various economic concepts, economic policies and analytical methods and some programs etc. If you are interested in economics and want to gain specialization about the economic framework, the might be suit you. This is the perfect for you. This is the another undergraduate programmer designed for prepare students in the field of management. This course duration is 3 year that provides theoretical and practical training which help to inculcate leadership and managerial skills in the field. A Good understanding of managerial practices and concepts can guide you to explore ample of opportunities in the business world. This is a 3 year Business administration course helping to build a base in core business disciplines and principal. You get to explore different functional areas of a business environment. So, if you are interested in getting an exposure to the various business aspects and get a hold of the concepts and idea of business administration, this course might be your choice and your future. In addition to academic learning, if you pursue BBA from a good university, you get well versed with business insights and real world business skills. After Completing your graduation, you can look forward to a post graduation degree like M.com or MBA and MBA with Specialization in any other field as per your preferences. This is an obvious choice for the ones thinking to build their career in the financial and business management field. This is the best professional courses after 12th commerce for the building a successful career in commerce stream. Becoming a Charted Accountant opens the various doors to exciting career opportunities in diversified sectors. you can act as tax consultant, an auditor, an advisor, financial officer and so on depending upon whether you go in your own independent practice or you settle for a corporate job. It requires lot of hard work and sincere efforts to enter this esteemed profession. It Might be easy for CA entrants to clear the initial level. But, the higher levels you reach i.e. Intermediate (IPCC) and CA Finals, the tougher it gets. So, Complete determination followed by consistent efforts are the keys to success. This is another Professional course that is oped by students after 12th commerce. This Course is provided by the institute of company secretaries of India. A company secretary is basically responsible for all the regulatory compliance of the company and acts as an in house legal expert. after doing CS you have an option to practice independently or look in for the job in corporate world. this is also a preferred choice for commerce students pursuing chartered accountancy and company secretary is the common choice for the commerce students to build a good career. This Course is provide by the institute of cost accountants of India or ICWAI. Certified Cost accountants maintain cost accounting records. do cost auditing, helps in planning, controlling and costing of products. You can do your own practice as CMA or hold managerial positions in public as well as private enterprises. The role of cost accountant goes beyond that of financial accountant by helping in production operations and processes. you can chose the cost audit area ,certification and consulting areas. This is the best choice after 12th commerce. If You are interested in building a career in areas of personal finance, wealth management, insurance planning, ,mutual fund investing then this might be a great fit for you. So, If you want to enter the financial planning world, then you need to get this certification as a certified financial planner or CFP. LLB is also a common degree that students pursue after their 12th standard. You might already know who a "lawyer" and "advocate" is and what are his duties. I think lots of students after 12th commerce join this course because this is best professional course ever. The Bar Council of India (BCI) is the main regulatory body of Law Education in India. BCI provides certificate of practice after completing of LLB. in order to practice you need to clear the all India Bar Examination. The law students have a great scope of establishing name,fame and a good career in the long run after 12th commerce. So, Here we Discuss the few courses after 12th commerce you can join and build a good career in your life.